A new study has found that 89 percent of the world's Internet traffic on tablets comes from Apple's iPad. Research firm comScore announced a Device Essentials analytics service earlier this week reporting on digital traffic by device. The study uses "census-level information from tagged web page content" to reveal device usage. The inaugural report found that Apple's iPad dominates across all 13 geographies tracked, accounting for more than 89 percent of tablet traffic across all markets. According to the report, the iPad makes up the highest percentage of total non-computer traffic in Canada with 33.5 percent. Brazil is second with 31.8 percent, though it should be noted that non-computer devices comprise less than 1 percent of traffic in the country. 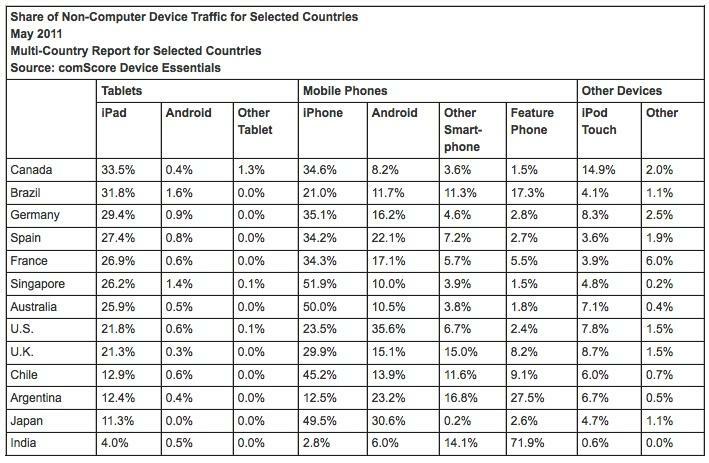 Though Android tablets are way behind the iPad in terms of traffic, Android smartphones led the iPhone with 35.6 percent of smartphone traffic, compared to Apple's 23.5 percent. comScore's data also suggested that iOS users are more likely to access the Internet over a Wi-Fi network than are Android users. 47.5 percent of iPhone traffic occurred over Wi-Fi networks, as opposed to 21.7 percent on Android phones. The vast majority, 91.9 percent, of iPad traffic took place over Wi-Fi, while Wi-Fi usage on Android tablets made up 65.2 percent. Last month, research group Nielsen published a study that found the iPad has an 82 percent market share of tablets in the U.S. The Samsung Galaxy Tab was second with a 4 percent market share. A number of analysts expect Apple to lead the tablet market for the "foreseeable future." As of earlier this month, Apple had sold 25 million iPads in the 14 months since the device's launch and is on track to sell more than 8 million units this quarter.